NPR News Nuggets: Rally Cat, Blessed Beer & A Cleaning Culprit Here's a quick roundup of some of the mini-moments you may have missed on this week's Morning Edition. 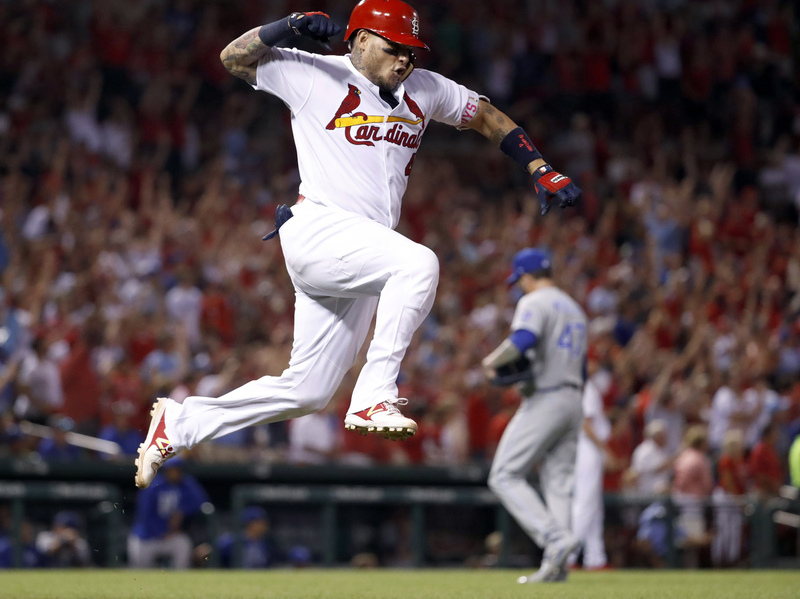 St. Louis Cardinals' Yadier Molina, left, celebrates after hitting a grand slam off Kansas City Royals relief pitcher Peter Moylan during the sixth inning of a baseball game Wednesday, Aug. 9, 2017, in St. Louis. Here's a quick roundup of some of the mini-moments you may have missed on this week's Morning Edition. You might have missed it, but NPR's Morning Edition did cover the initial story of seven student priests who were tragically turned away from a bar in Cardiff, Wales after the staff thought they were dressed up for a bachelor party. The group just wanted to celebrate a friend's ordination. After the manager realized they weren't dressed up in costumes, he bought them a round on the house. Now, the story gets even better. As Morning Edition guest host Ailsa Chang said on Wednesday, all of the attention led the pub to rename one of its ales "The Thirsty Priests." The beer comes with a slogan saying "Saving souls and satisfying thirst." Talk about a tale of redemption and spreading some good spirit. You know the saying: "One man's lost cat is another man's good luck charm." At least that's the saying the St. Louis Cardinals are adopting after a cat got onto the field during Wednesday's game against the Kansas City Royals. As Morning Edition host David Greene said on Thursday, the Royals announcers were poking fun at the little kitten, but then the next pitch came and the Cardinals' Yadier Molina hit a grand slam that ultimately won the game for St. Louis. The cat captivated the crowd and a crew member was sent out to retrieve it. Well, he got the cat and then the cat bit him as he was being escorted off the field. The Rally Cat saga doesn't end there. The cat later escaped and was found at a local park and taken to a vet. Since then, the cat has become a local celebrity and constant presence on the team's social media account. As ESPN reported, after the initial ordeal, Cardinals manager Mike Matheny said, "I'm not a cat person, but I sure liked that one." And as it turns out, everyone is a cat person. The Cardinals have said they will honor Rally Cat during their game on Sept. 10 with a Rally Cat Appreciation Day commemorated by T-shirts and a portion of the ticket sales benefitting former Cardinals manager Tony La Russa's Animal Rescue Foundation. As much as I love Rally Cat, it's important to remember that this is not the first time a furry critter has been a sign of luck for the Cardinals. In 2011, an aloof squirrel became Rally Squirrel after interrupting play. That year, the team went on to win the World Series. So there's hope yet for Rally Cat's power. After real life horror stories and movies like Home Alone, it's understandable why people are paranoid about leaving their homes while on vacation. You never know who's watching and you definitely don't want burglars to take advantage of your absence and have them clean your house — unless they really just clean the house and don't take anything. As Morning Edition host Rachel Martin said on Friday, a resident of Rosslyn, Va., came home after being on a trip and realized someone had broken into their apartment. Thankfully, nothing had been taken, but whoever came in had moved some things around and cleaned the entire apartment. They probably just decided some feng shui and a scrub down was necessary. Despite the gesture, it makes sense that the resident called the police and reported the culprit.